First stop a women’s cooperative which supports approximately 30 single women (and their families). 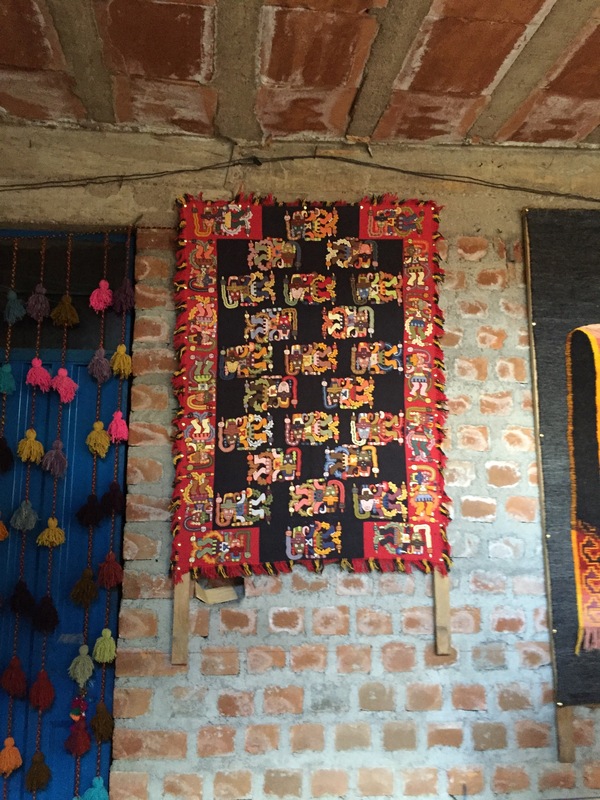 The women sell their handwork at craft markets and online. The workshop of Julio Galvas Ramos – an alabaster carver. 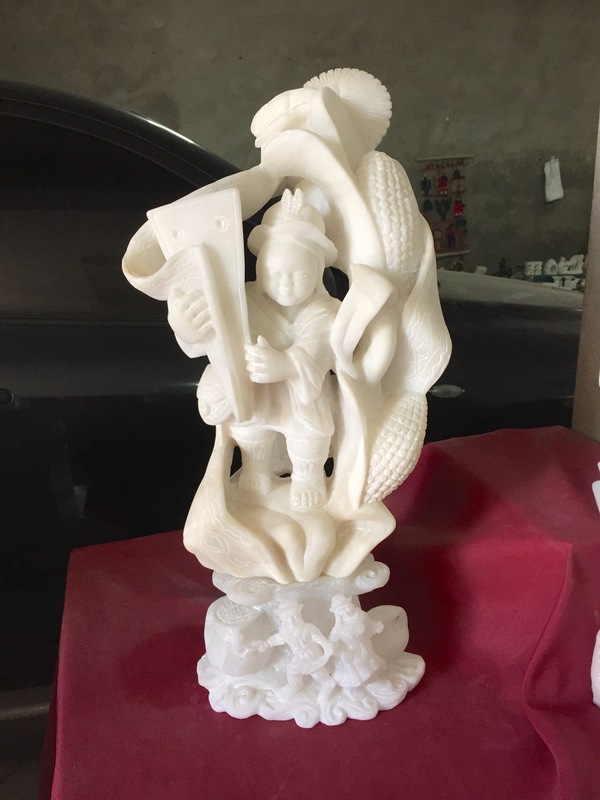 This Maestro does intricate carving – his son is a carver of sculptures as well, daughter, and daughter-in-law also work in alabaster carving jewelry and other small items like candle holders. 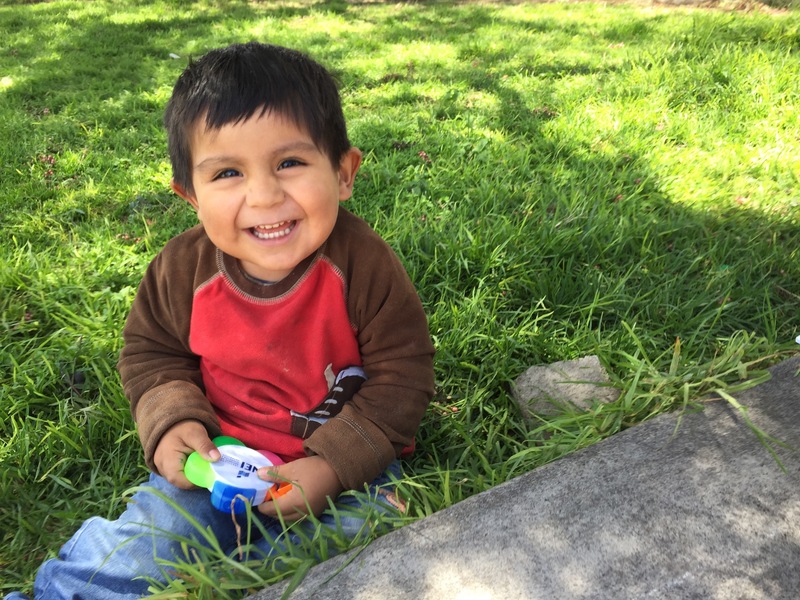 Galvas Ramo’s grandson – love the smile (around two years old), great giggle as well. 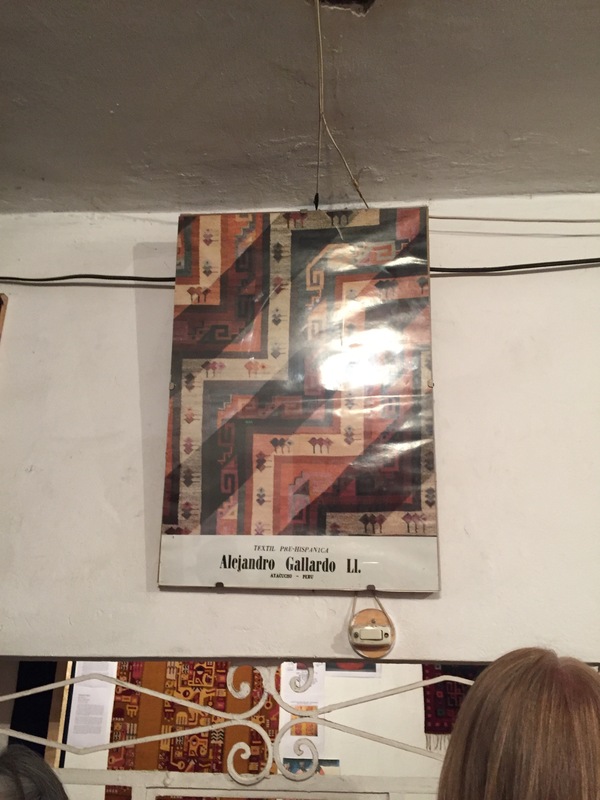 The tapestry workshop of Alfonzo Sulca – I came close to buying this small tapestry – didn’t because I had no idea where I’d hang it once I got home! 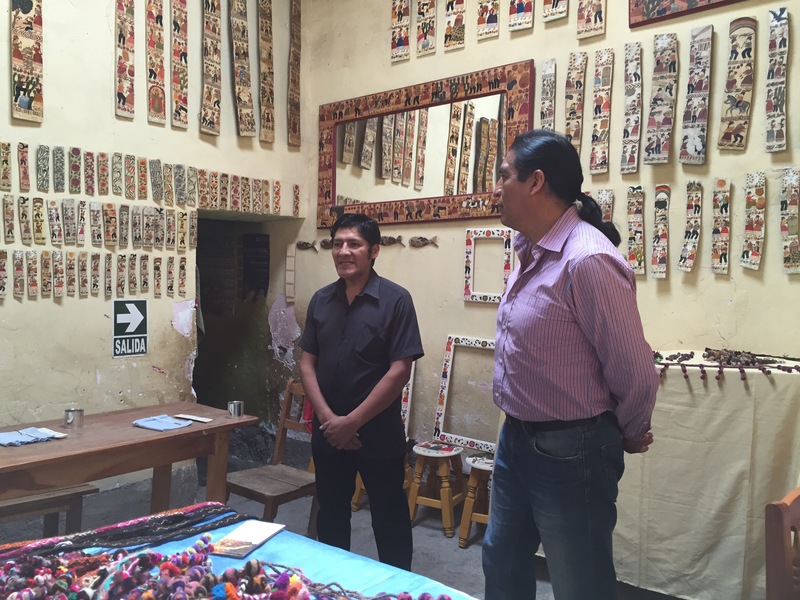 After lunch we visited Casa del Retablo – Maestro Silvestre Ataucusi Flores. The “Retablo” I think may be a uniquely Peruvian art form and Sr. Flores is certainly one of the best. 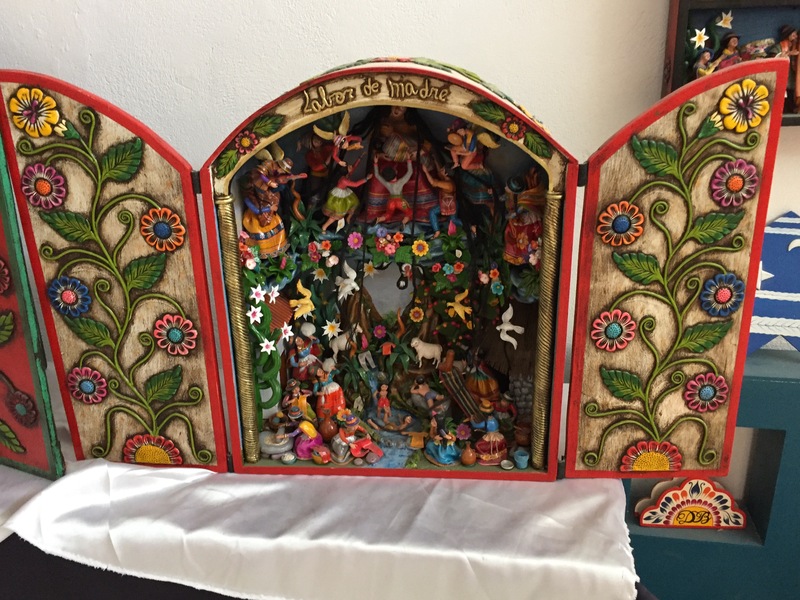 It’s a “box” filled with little figures in a tableau – originally all religious in theme – but Sr. Flores’ work depicts the many aspects of Peruvian life. 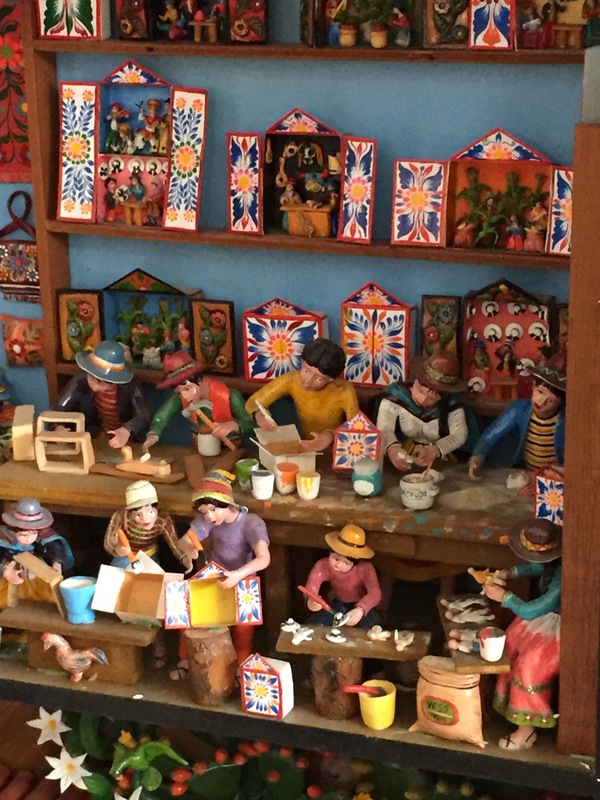 The detail below shows Retablo makers at work. I had a rough night last night, hourly bouts of diarrhea with constant nausea and some vomiting. During the night I contacted the Blue Cross travel insurance assistance line and had a lovely conversation with a young man in Montreal who encouraged me to be seen by a live doctor (necessary if I was to make any medical expenses claims). So early this morning I asked Giancarlo to set something up. He consulted with the hotel management, I think, and so around 9:00 am he and I took a cab to the Clinica El Nazarine – one of the many private clinics in Peru. First you pay for a consultation (~$20 CAD -definitely reasonable – the same cost as Peruvians), then I was seen by an affable young physician and with Giancarlo as translator described the problem: that I needed to control the diarrhea so I could get on a plane 2 days hence, and clear up the nausea so I could eat something to regain a bit of strength. Dr. Balleta did speak some English so among the three of us we managed the interview and physical examination pretty well. Dr. Balleta’s recommendation was an IV infusion of Dramamine (to settle my stomach) and something else for my weary gut. So I went ahead and did that. It took two hours for the litre of saline + meds to drip through but I have to say the results were immediate – the nausea was gone. He then prescribed a couple of different meds to calm my stomach further and an antibiotic I’ve never heard of (although I was able to find a description online) – I start that one tomorrow morning and take it for four days – a short course. The treatment and meds cost about $36 CAD – so for $56 I’m back on my feet – would have cost far more in North America. As we were getting ready to leave I said to Giancarlo he better make sure he adds the clinic and Doctor’s name to his files for future need. Had he had the information, I bet I could have had the Traveller’s Diarrhea under control much faster. By the the time we got back to the hotel I was actually hungry for some lunch. A plain fried egg sandwich (no mayonnaise) fit the bill and after eating I felt strong enough to rejoin the group for the afternoon visit to Sr. Sergio Rojas’ natural dying and embroidery workshop. 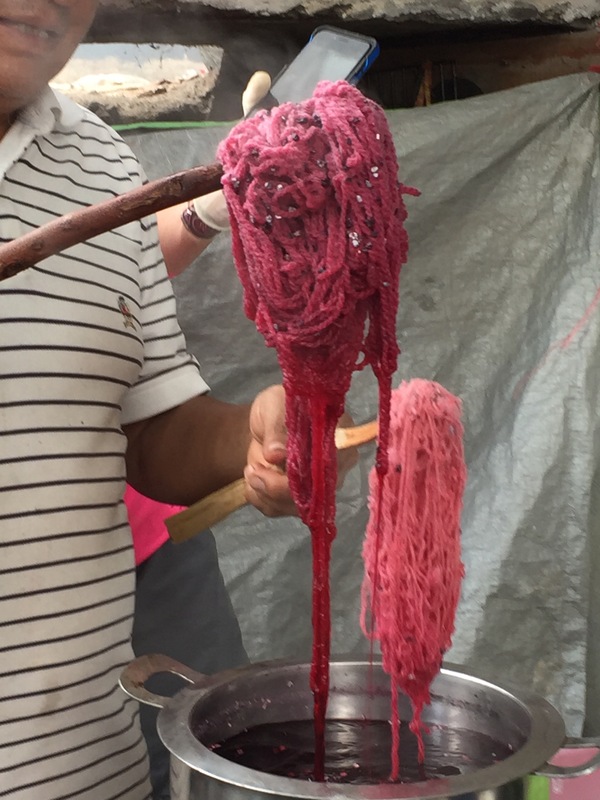 Here he’s dying sheep wool with cochineal which he ground from dried beetles (remember we collected some from prickly pear cactus last week, although these come from Brazil, apparently) – the longer in the dye, the darker the shade. Add the juice of half a lime and the shade becomes more orange; add some ashes and the shade becomes a lush beet colour. The range of colours from natural materials like turmeric and indigo solo or in combination is quite amazing. (It all brought the reed dying we’d seen done by the basket maker – similar strong colours). Inside we were able to see more embroidery work being done. Finished embroidered tapestries were on display in a “gallery” room (part of the residence/workshop complex). Although the room was dark, it’s still possible to distinguish the fine detail the women achieve in these cotton on wool hangings. So I’d say tomorrow I’m back in business – I really feeling considerably more human now and expect a decent sleep tonight. Yeah! I’m a pretty efficient packer when it comes to travelling. Over the years, I’ve learned to bring about half of what I lay out and most of the time I use what I bring. This Peru trip has been crazy. The travel notes warned me about the temperature range in Ayacucho ~ 6-10 C at night, high 20s C in the afternoon. I monitored the weather for a couple of months before departing and watched the daytime temperatures climb slowly. So I packed a mixture of sweaters and t-shirts hoping I’d covered all the bases – layers would be the answer. Turns out more than half of what I brought I didn’t need and haven’t worn. Didn’t need the wool socks, the sweaters and turtlenecks. Even the light silk/cotton pullovers have been on the warm side. I have worn the t-shirts and cotton shirts, the cotton ankle socks but I could have got away with the one pair of Sketchers sneakers – the sandals and shoes weren’t necessary. And of course, now that I’m hotel bound, I’m wearing the same few items over and over again. Friday we depart Ayacucho for Lima. I think the trip was over for me Saturday. “Montezuma’s Revenge” has laid me low. I’m still forcing the electrolyte fluids but every swallow is an ordeal. Again, I managed to shower this morning, and I had more toast at lunch time. I cannot face quinoa, rice, potatoes. Maybe a poached egg this evening, maybe some more chicken broth. I know I’m not going far the next two days. Sab has also succumbed. She experienced the onset when she got back to the hotel last evening. She and I have been checking up on one another during the day. Elaine has been feeling off colour but able to carry on. The serenity prayer starts – “give me the serenity to accept what I cannot change…” Well this I cannot change! No point in fighting it. Just hoping I’ll feel strong enough to get back to Lima and then on to home! Not much to report on today. I slept for much of the night; felt strong enough to shower this morning. Went for a breakfast of toast and more electrolyte water. Had the Senioras clean the room. Had lunch with Anabel in the hotel Cafe – some chicken soup (Sopa de Pollo) – I ate the few cooked vegetables and a few bits of chicken. We made a visit to the pharmacy for more electrolytes and then back to my room to nap away the afternoon. On the way to Vilcashuamana Elaine thought to herself “thank goodness we won’t have to return in the dark” – but of course the last two and a half hours of the drive were after dark! I’m so glad I didn’t even contemplate the trip! 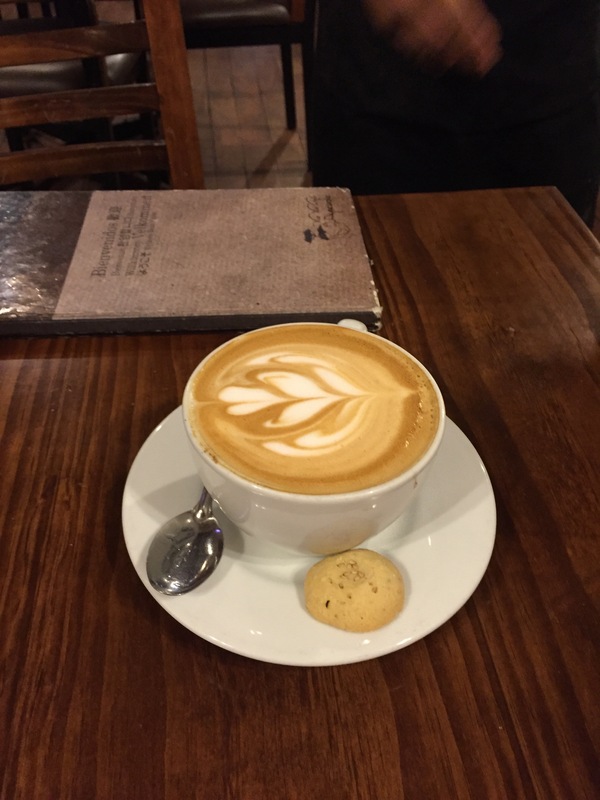 My only photo for the day is of the cappuccino Elaine ordered this evening. The barista who prepared it took great delight in the elaborate decoration he created for her. I’ll see how I feel before committing to any travel tomorrow – I have to feel reasonably confident a bagno (bathroom) is close at hand even though I would take Imodium before departing. One of the few things I did today was upgrade my Lima/Newark flight to Economy Plus – to give me more leg room on the return trip. It’s a long flight and with Imodium I should be able to sleep much of the way. Food, not wonderful and hazardous! First of all you can’t tell whether the mild malaise you feel is food or altitude sickness – so you try a bit of coca tea, but I didn’t like how that made me feel. So I tried eating vegetarian but I can manage only so much quinoa and steamed vegetables. And then last evening I knew I was in trouble – I was having mild diarrhea from the beginning (taking probiotics, Pepto Bismol, visited the pharmacist with Giancarlo for Peruvian remedies) but last night at around 2:00 am “travellers diarrhea” hit! I spent the next three hours running to the toilet. Finally I knocked on Sab’s door next to mine and asked her to get Giancarlo for me. So at 5:30 he called the Doctor in Cusco (an 8 hour drive away from Ayacucho) that Puchka Tours uses because he speaks English, to consult with him about what to do. “Imodium” he ordered – take two immediately, then two more in eight hours, then two more eight hours again if the diarrhea hasn’t stopped. Well, I didn’t have any with me because Sasha in her travel notes was adamant we not use it. Fortunately Sab had some so at 6:00 I took two right away and that was effective. The doctor also wanted to prescribe an antibiotic, something for nausea, and because I was now dehydrated he insisted I drink vast quantities of an electrolyte drink (that tastes awful) – a litre every 4 hours until I started feeling stronger. Of course the pharmacy doesn’t open till 7:00 – promptly at 7:00 Giancarlo fills the prescriptions, and he and Anabel and Sab and Elaine begin nursing me. I haven’t moved from the bed all day except to go to the bathroom. Anabel brought me dry toast a couple of hours ago to nibble on. And now I’m settling in for the night. I feel better than I did three hours ago, but I’m guessing it will be at least another full day before I’m up and around. The group is off on a long bus trip tomorrow – either Anabel or Giancarlo will stay back with me. And in the meantime I’m continuing my regime of having a glass of electrolytes hourly – I’m not going to bother setting my alarm to wake me, but I’ll drink as much as I can through the night. Everybody has been most accommodating and helpful – picking up bottled water, electrolytes, stopping in to see If I want/need anything. I will get through this like travellers before me! I have bought very little. I’ve taken a gazillion pictures – that’s enough. 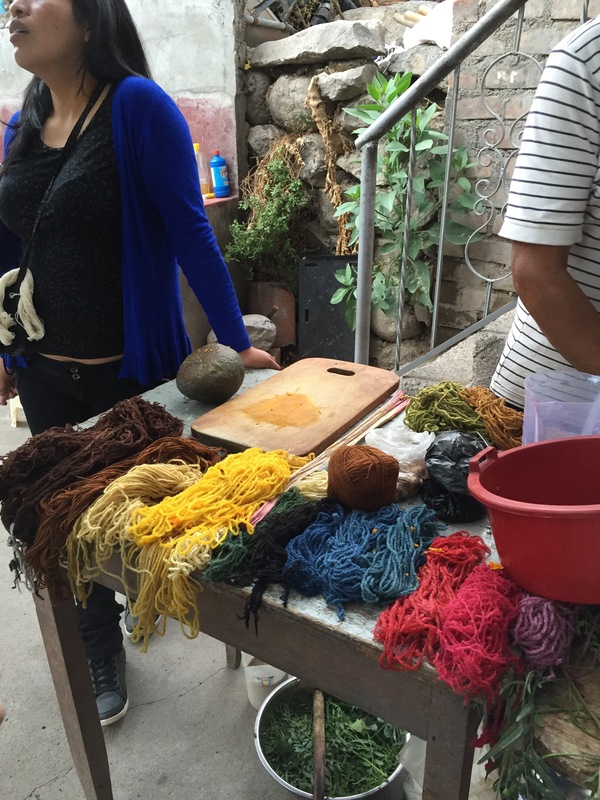 I’ve picked up an alpaca shawl, another shawl woven of beautiful Peruvian cotton, a couple of pieces of typical Peruvian striped woven fabric, and one small piece of embroidered cloth. I don’t need more stuff, nobody else needs more stuff, so that’s about it for my shopping. I haven’t said much about the tour group – perhaps I should. 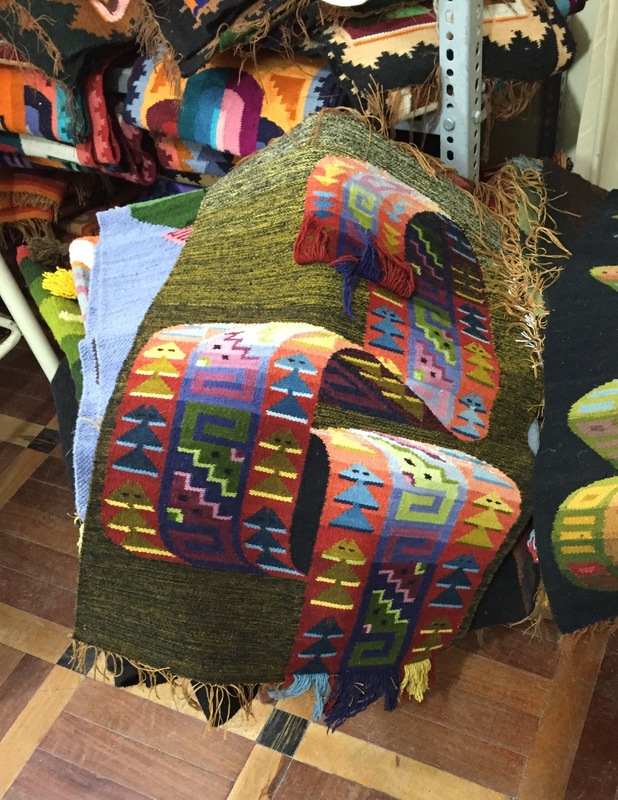 Peru was not on my bucket list – but when the trip to Paris/London fell through I googled to see what other textile trips I might find. That’s when I happened across Puchka Textile Tours. 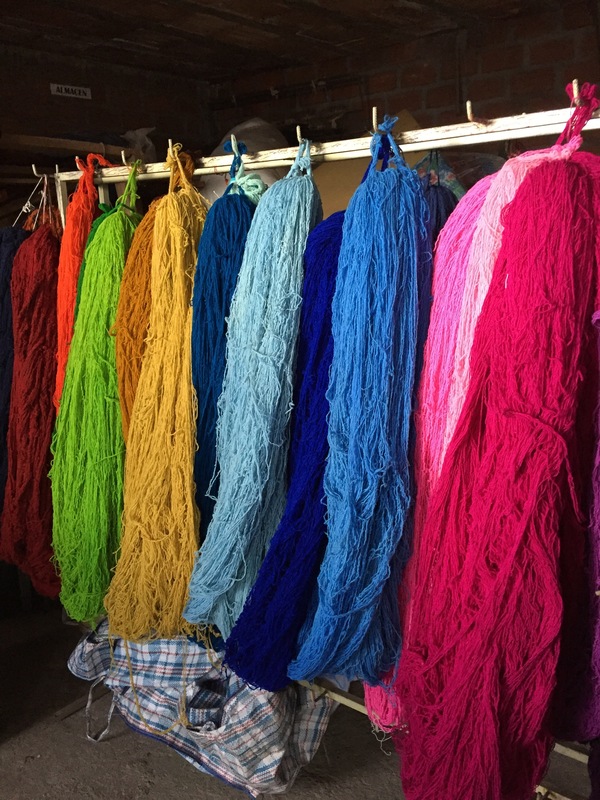 They do two tours – a 22 day with eight days of hands on weaving / knitting / embroidery, etc. 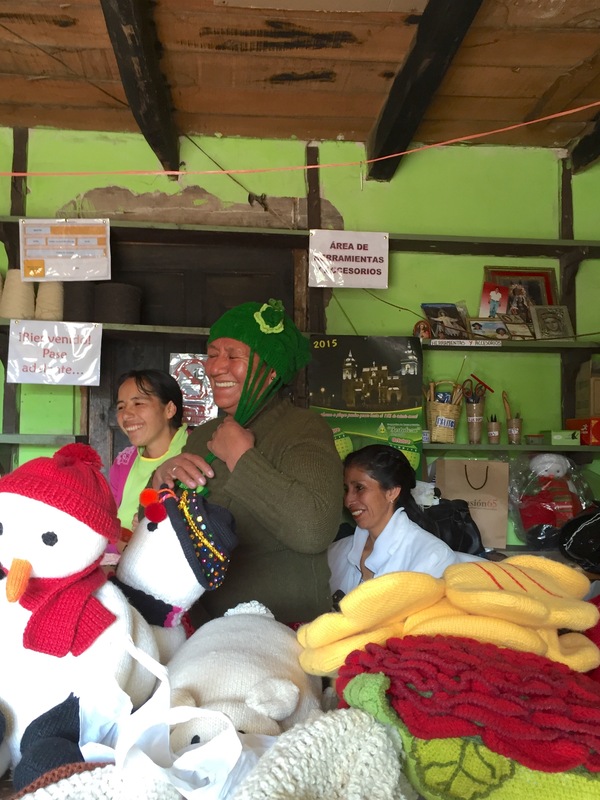 (and including a visit to Machu Pichu); and a 12 day tour with visits to the artisans of Ayacucho. I chose the 12 day tour simply because I find at the end of two weeks I’m usually ready to return home. This tour has been well organized, all I had to do was arrive in Lima, and our Peruvian guides and driver have taken care of the rest. So today was a typical day – we began with a visit to Marcial Berrocal – he paints “tablas”. Tablas are traditional in the community of Sarhua. 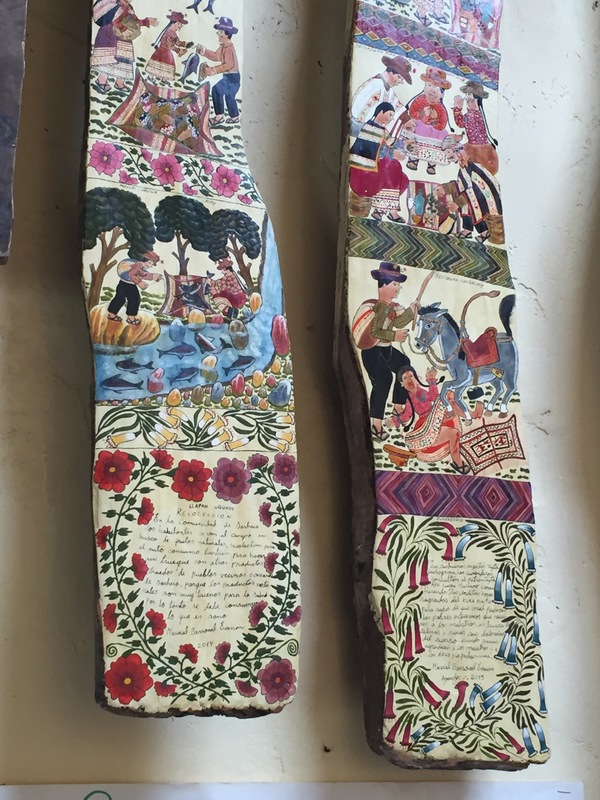 Originally tablas were paintings depicting a family’s story, done on slabs of agave wood (planks cut from the tall woody flower stalk of the agave plant) and affixed to a beam in a new house. 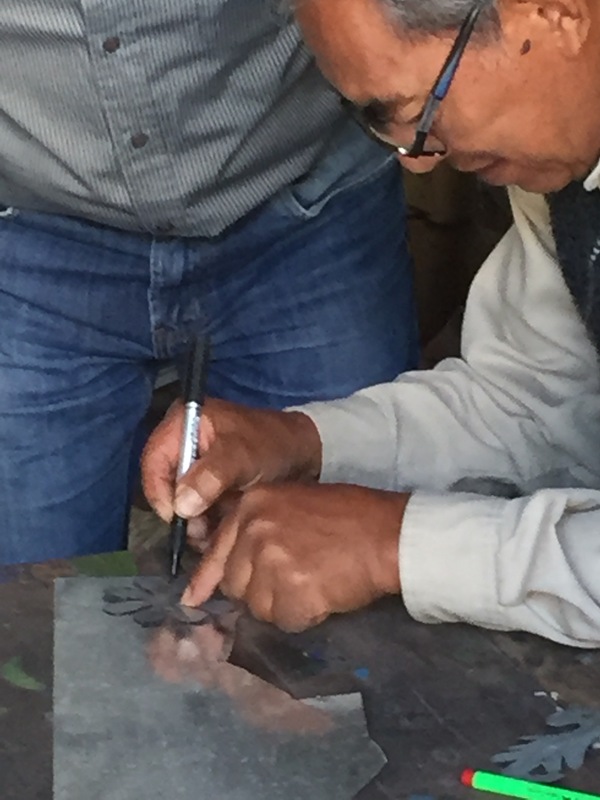 Sr. Berrocal paints tablas in many sizes, each depicting aspects of Peruvian life. He spent some time explaining his tablas to us then invited us to paint a small one ourselves. This may look like folk art, but having tried my hand at painting one, I can tell you there’s skill and technique involved! 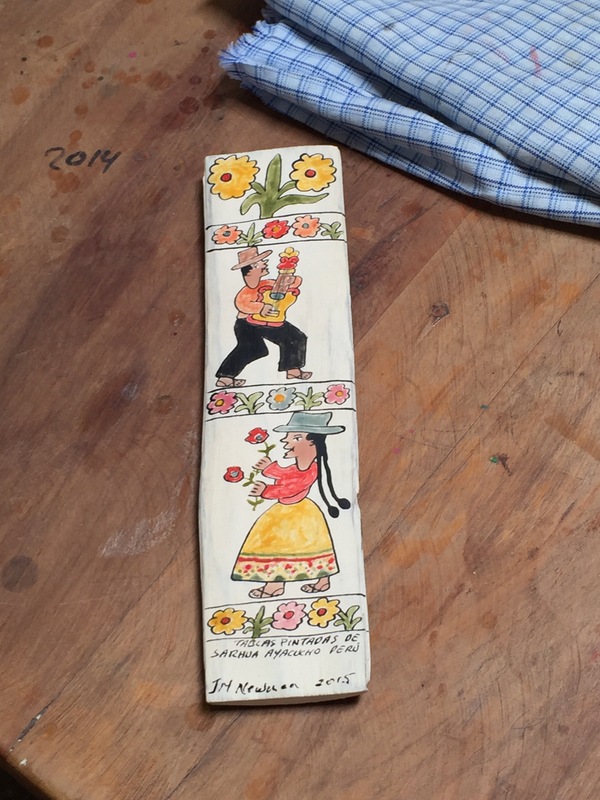 This is the tabla I painted – filling in the outline created for us by Sr. Berrocal. 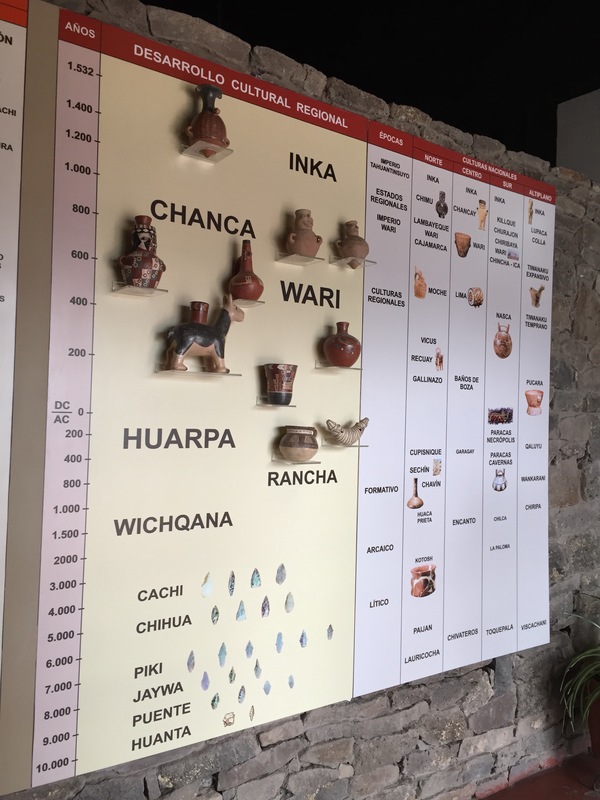 Following our visit to the Berrocal workshop we went to the Museo Historico Regional housing an exhibit showcasing artifacts from the Wari empire. The pottery is highly developed with lots of intricate detail. 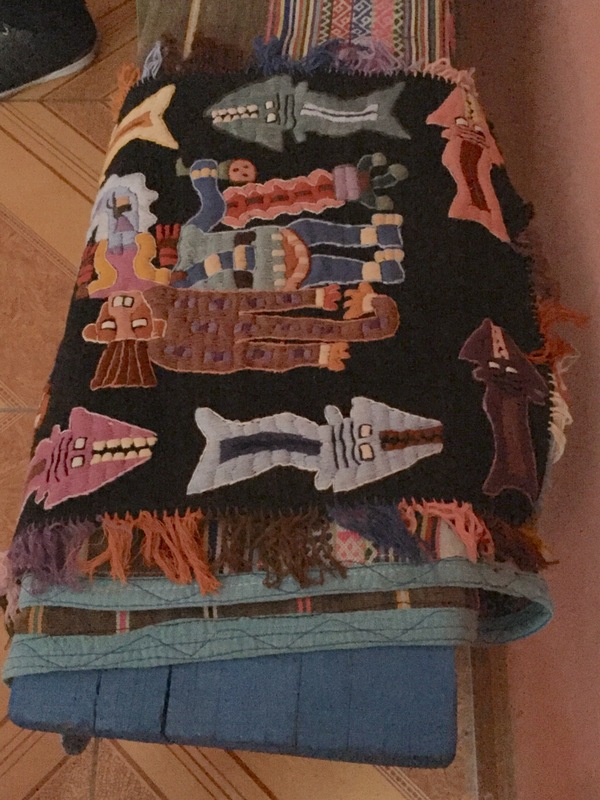 The Peruvians with whom we are spending time seem to have a strong connection to their Wari past, incorporating Wari iconography into their work. 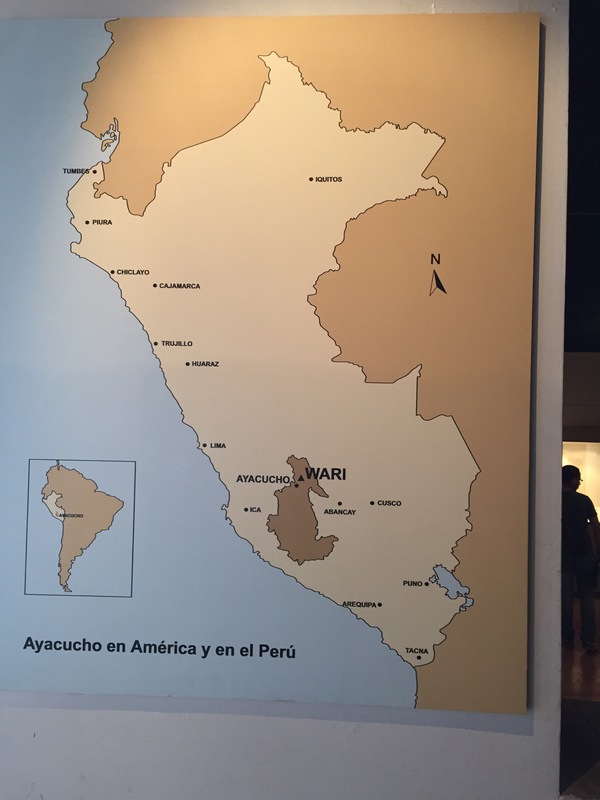 Although the Wari fell to the Inca, the Inca to the Spanish, the Wari influence still seems strong in contemporary Peru. Today was Saturday – on the weekend the bustle in the square where our hotel is located increases. First thing this morning the “ice cream” ladies were out in full traditional dress making fresh ice cream. They were busy the entire day. They have a tub filled with ice, in which sits a large pot filled with the ice cream custard. They spin the pot in the ice till the custard is the right consistency – one of our ladies tried spinning the pot – it was hard work, she reported! After lunch we visited the Fortaleza Textile workshop where we were able to see the beautiful embroidery this family does. 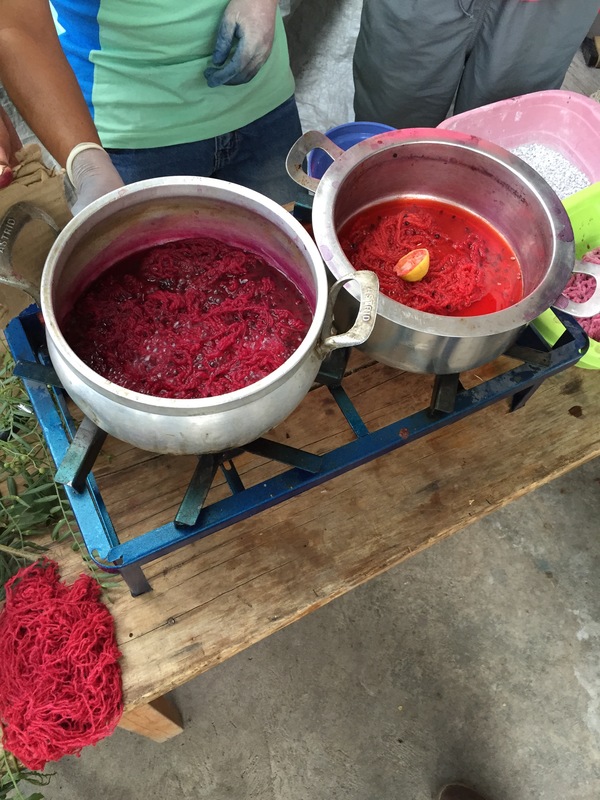 The Fortaleza are constantly innovating in order to build a market for their work. 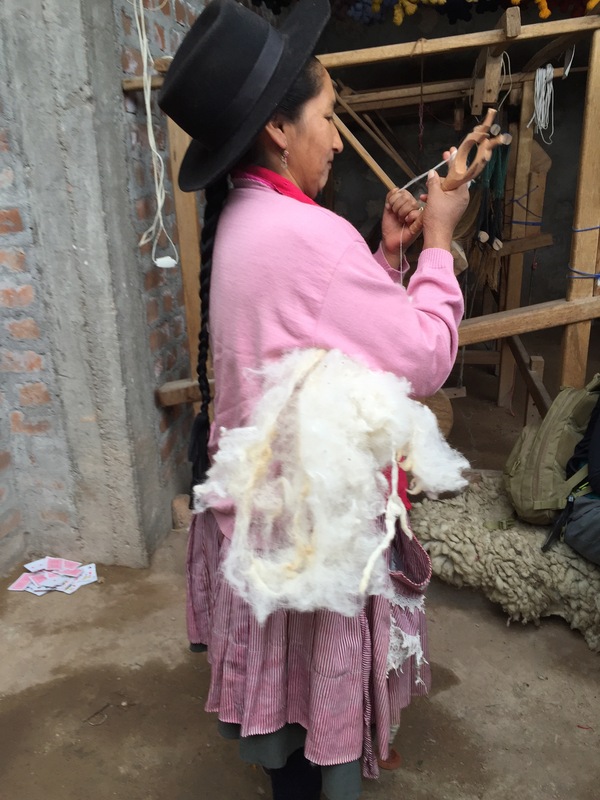 Here we got a lesson in braiding – I am able to do a 4-thread flat braid, a square braid, but for the life of me I could not figure out the sequence of moves to create the round spiral pattern woven here in Ayacucho. I think I will have to get some plastic lacing that I braided as a child and see if I can figure out this braided lanyard design. In addition to traditional hand embroidery techniques, this family produces complex, machine embroidered reverse appliqué designs derived from designs used in the women’s skirts from their ancestral town. Tomorrow we have a “down” day – I’m looking forward to a slower pace and a return visit to the market where I can browse more widely. 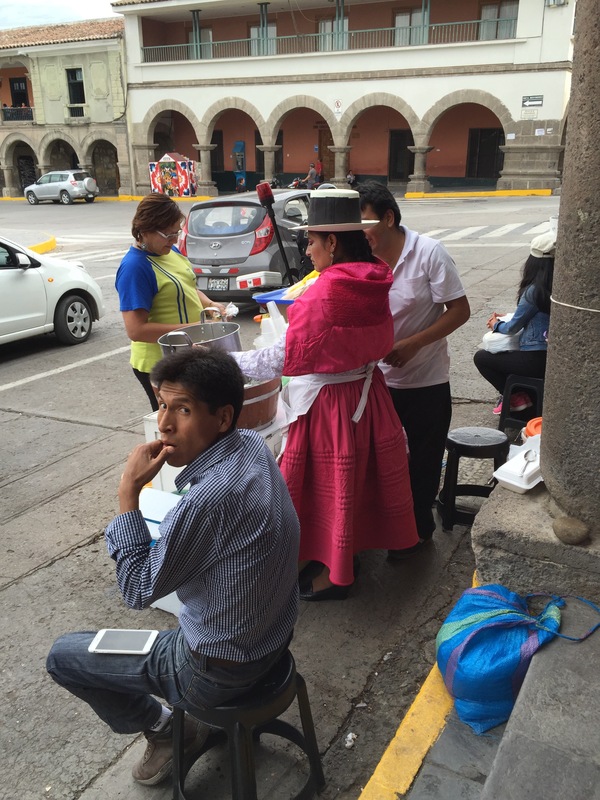 Then Monday we’ll be back on a tight schedule – more archeological sites and visits to artisans. This trip will be over before we know it. We visited some very interesting master artisans today. First a master tinsmith Sr. Araujo. As with the other artisans we’ve visited, the Araujo workshop is a family enterprise – sons, daughters, brothers, grandchildren are all engaged in aspects of production. 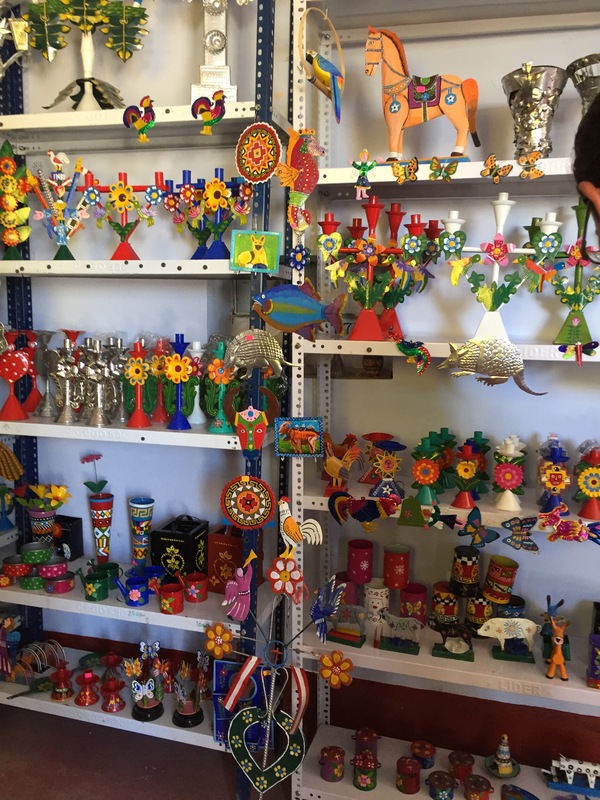 There are very few tinsmith in Peru so support for the work these artisans do is very limited. However, they’re hard working and enterprising. Sr. Araujo showed how he crafts elements of his works from tin. He starts by tracing a template – traditionally, he would have used an awl (a pointed metal tool) but he was tracing with a permanent marker! How long had he been doing it that way? Maybe 18 months. What fascinated me were the many tiny improvisations that facilitate the production – the permanent marker being just one. 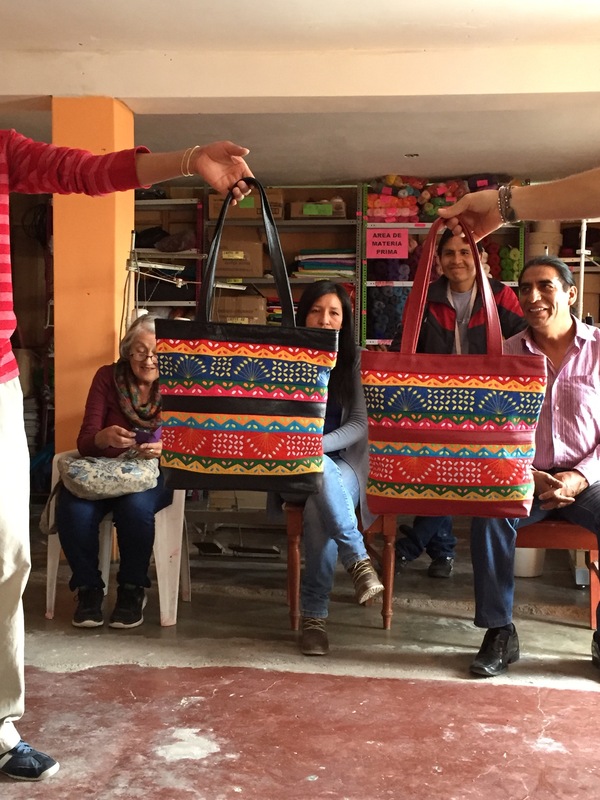 Our second visit was to the workshop of Alejandro Gallardo – a young talented weaver. 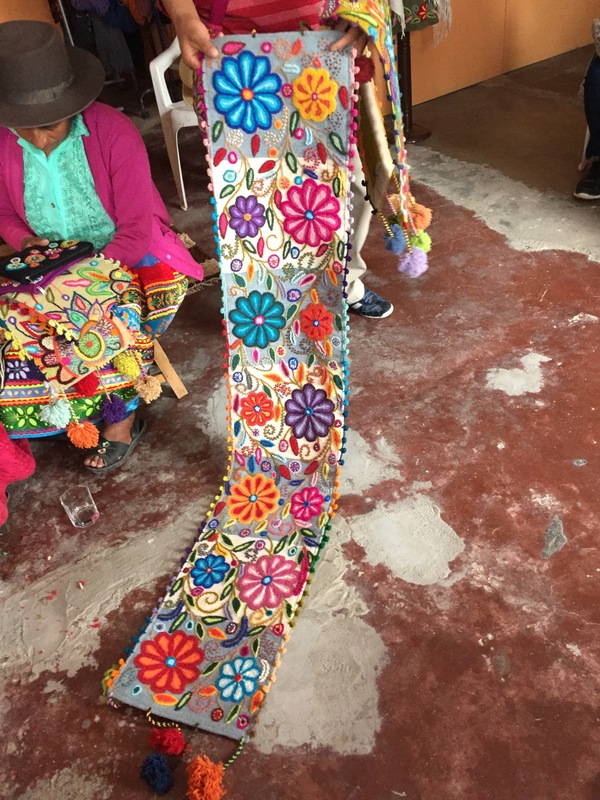 This visit was an impromptu one – the other day while at the craft market, I got into a conversation with Alejandro’s mother – she speaking no English/me no Spanish we managed to communicate about my knitting and textile work and about her son’s tapestries. Maximo came over and greeted her warmly and took the information about the location of the family workshop. When another visit fell through this morning we made a stop at the Gallardo workshop. Alejandro allowed us to take photos but asked that we not post them. 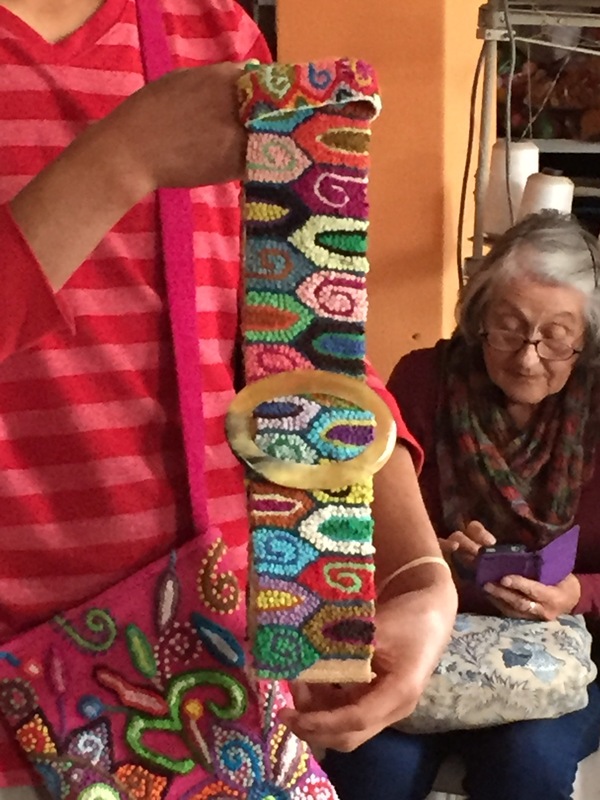 I wish I could show you the beautiful, fine alpaca tapestries this family makes! 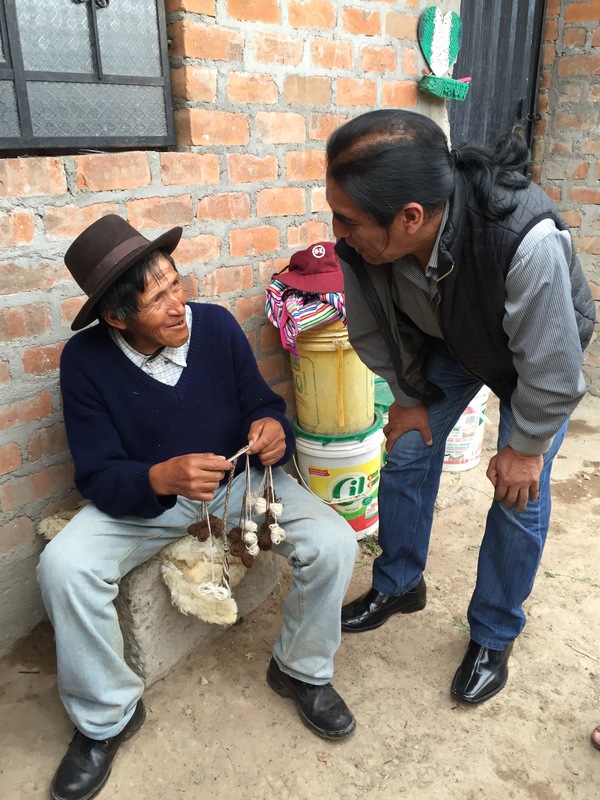 Alejandro and his father (now 4 generations of weavers) are hard at work preserving pre-Incan motifs using all natural dyes in their work. They (and a couple of other family members) weave for many hours each day. Each tapestry more intricate than the next. Alejandro spent quite a bit of time walking us through the Wari images, which are his passion, based on textiles recovered from archeological sites. His tapestries draw on these elements. 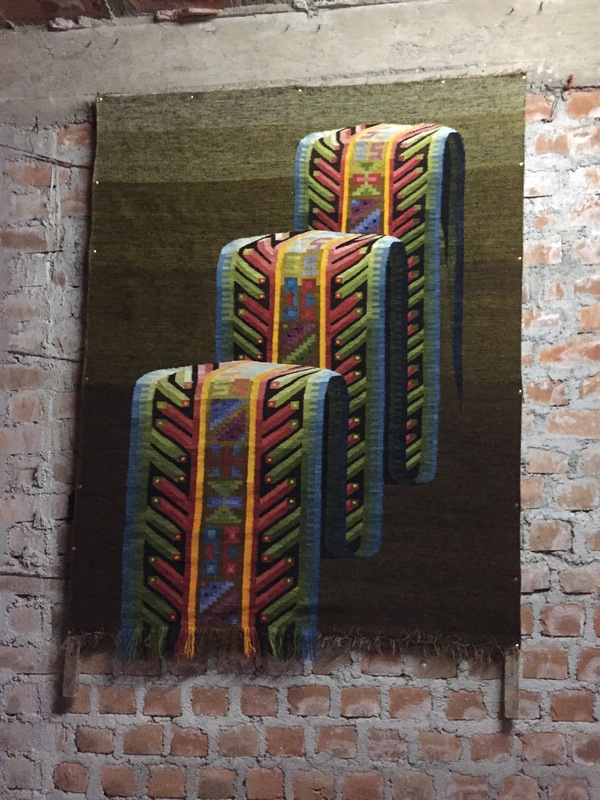 His father was working on an Incan-based weaving building the iconography from memory. With Maximo’s help, the elder Gallardo and I had a lovely conversation about his work as a weaver. 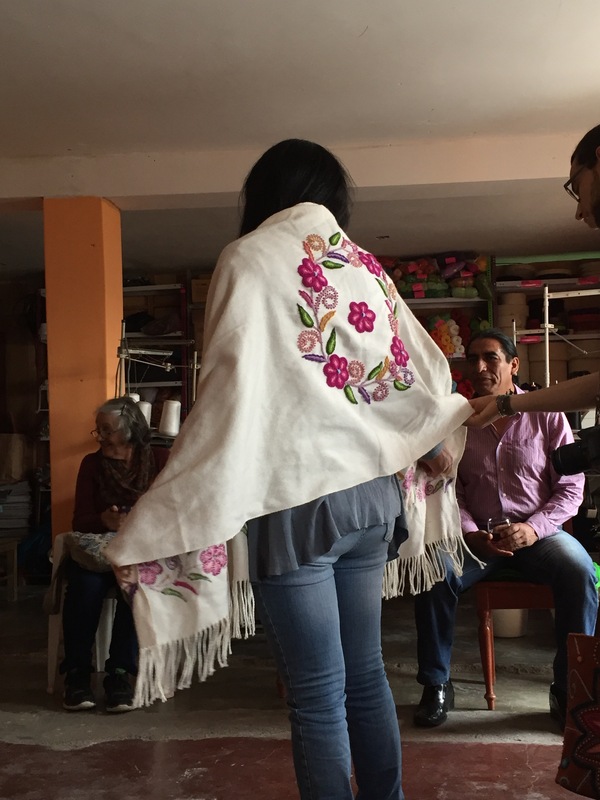 Our third stop after lunch was to Jesus Huarcaya Huamani’s tapestry/embroidery family workshop. 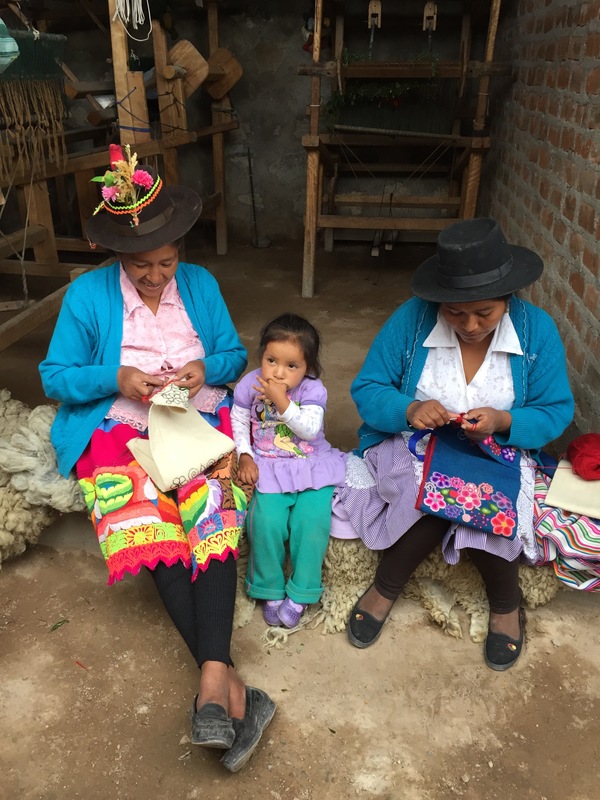 When we arrived the senior Sr. Huamani was working on an intricately braided rope, two of the women were doing embroidery, the third was spinning sheep’s wool using a drop spundle (creating a fine, even spun thread). Elsewhere in the workshop two other male family members were weaving tapestries. spin ourselves using the drop spindle – it looks easy as the women do it but there is a lot of technique involved. My hands were useless.